Questioning utopian desires, Siobhan O’Flynn looks at Toronto’s Nuit Blanche in relation to the impact that social media has on participants’ ability to share and record their experiences, to self-organise, and to engage in the production of a transformative, real world event. Siobhan O’Flynn is Senior Lecturer in the Canadian Studies Program at the University of Toronto and Faculty with the Canadian Film Centre’s Media Lab. Dr. O’Flynn published Nuit Blanche and transformational publics in a recent special issue of the journal, “Public” edited by Jim Drobnick and Jennifer Fisher, the theme of which was Art and Civic Spectacle. Nuit Blanche—an international network of locally organised nocturnal art events—has become one of the most widely loved and well attended examples of contemporary civic spectacle. The first Nuit Blanche took place in Paris just over ten years ago, but its roots go much deeper. Art and civilians had begun infiltrating the night at luminous events around Europe throughout the preceding decade. Early versions of the festival included Helsinki’s Night of the Arts (est. 1989), St. Petersburg’s White Night’s Festival, (est. 1993), and Berlin’s Long Night of Museums (est. 1997). The closest heriditary precursor to Nuit Blanche was Jean Blaise’s festival in Nantes, Les Allumées (The Illuminated). Launched in 1990, the festival was set to run for six years, featuring visiting artists from six cities, one city per year. Each year, it ran for six nights, from 6pm to 6am. Les Allumées was so successful that the mayor of Paris invited Blaise to create a similar event in France’s capital. 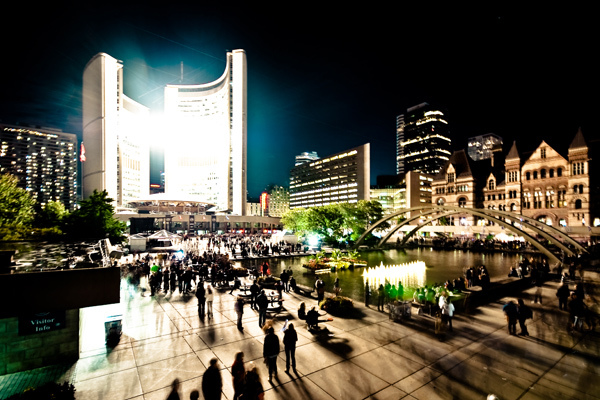 In 2002 Nuit Blanche proper lit up urban streets for the first time. Various iterations of Nuit Blanche now take place in dozens of cities worldwide, featuring thousands of artists, and drawing droves of attendees. These exchanges make visible the fluid actualization and processual experience of participatory, emergent public(s) that accord with how Michael Warner defines a ‘public’: that it is self-organizing, involves a relation amongst strangers, is simultaneously personal and impersonal in address, is constituted only through attention, and provides a discursive public space. She does differentiate between the “emergent public” of Nuit Blanche and the “counter-public” that (Yale social theorist) Warner defines as having an “awareness of subordinate status”. And despite noting that attendees reported a relaxation of social norms throughout the night, she clearly distinguishes between the enhanced civic engagement that is demonstrated at Nuit Blanche, and the radical social reversal that is inherent in notions of the carnivalesque. Nuit Blanche’s transformational spaces are simultaneously unfamiliar and often magical while remaining emphatically “here” and this duality opens opportunities for new, unexpected modes of engagement with familiar places as spaces of play, performance and interaction. Through analysing the organically produced and automatically persevered remnants of digitised social engagement at Toronto’s 2010 Nuit Blanche, O’Flynn explores the possibility that radical civic transformation can be achieved through participation and presence, as opposed to opposition and withdrawal. Siobhan O’Flynn is a Senior Lecturer in the Canadian Studies Program at the University of Toronto and Faculty with the Canadian Film Centre’s Media Lab. Her academic research examines the function, design and experience of narrative in interactive environments; cross-platform to transmedia design; foresighting emergent trends in digital storytelling and entertainment in a Web 2.0/3.0 world; and pyschogeographic practices across media. She is currently engaged in a two-year research/data visualization project, funded by SSHRC, on Nuit Blanche and transformational publics with her collaborator, Faisal Anwar. PUBLIC is a beautifully designed peer-reviewed journal founded in Toronto as an intellectual and creative forum that focuses on how theoretical, and critical issues intersect with art and visual culture. Each issue’s editors explore a contemporary theme by bringing together a unique assemblage of Canadian and international art projects with writing by scholars, curators, critics, and artists. This, along with book and exhibit reviews, creates an assemblage of artists projects and original writing on prescient contemporary themes in art and culture. PUBLIC has provided a forum combining critical thinking with visual art for over 20 years producing an aesthetically engaging journal which explores themes in-depth in each issue. PUBLIC is committed to critical work and reflection, and provides a unique perspective as a journal coming from Canada.